Please call for price (310) 659-3110. All the Presidents' Bankers is a groundbreaking narrative of how an elite group of men transformed the American economy and government, dictated foreign and domestic policy, and shaped world history. Culled from original presidential archival documents, All the Presidents' Bankers delivers an explosive account of the hundred-year interdependence between the White House and Wall Street that transcends a simple analysis of money driving politics--or greed driving bankers. Prins ushers us into the intimate world of exclusive clubs, vacation spots, and Ivy League universities that binds presidents and financiers. She unravels the multi-generational blood, intermarriage, and protege relationships that have confined national influence to a privileged cluster of people. These families and individuals recycle their power through elected office and private channels in Washington, DC. All the Presidents' Bankers sheds new light on pivotal historic events--such as why, after the Panic of 1907, America's dominant bankers convened to fashion the Federal Reserve System; how J. P. Morgan's ambitions motivated President Wilson during World War I; how Chase and National City Bank chairmen worked secretly with President Roosevelt to rescue capitalism during the Great Depression while J.P. Morgan Jr. invited Roosevelt's son yachting; and how American financiers collaborated with President Truman to construct the World Bank and IMF after World War II. Prins divulges how, through the Cold War and Vietnam era, presidents and bankers pushed America's superpower status and expansion abroad, while promoting broadly democratic values and social welfare at home. But from the 1970s, Wall Street's rush to secure Middle East oil profits altered the nature of political-financial alliances. Bankers' profit motive trumped heritage and allegiance to public service, while presidents lost control over the economy--as was dramatically evident in the financial crisis of 2008. This unprecedented history of American power illuminates how the same financiers retained their authoritative position through history, swaying presidents regardless of party affiliation. 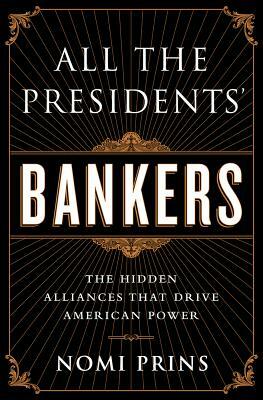 All the Presidents' Bankers explores the alarming global repercussions of a system lacking barriers between public office and private power. Prins leaves us with an ominous choice: either we break the alliances of the power elite, or they will break us.